The Red Kangaroo is well known throughout the world. They get their name from the reddish color of their fur. However, it can also be gray or brown as well. They do vary quiet a bit in that department which is why people may not realize which species it was that they actually saw. You will notice that they have a small head and very large ears that stand straight up. They have excellent hearing due to the design of those ears. The males can grow to be up to six feet tall and weigh close to 200 pounds. The females are smaller with a size of about 4 ½ feet and they weigh about 100 pounds. 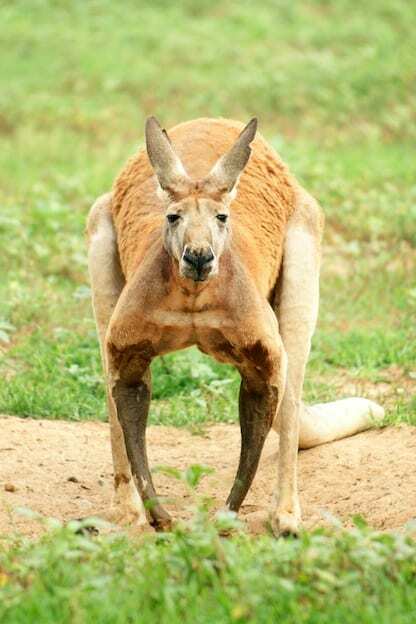 The overall anatomy of the Red Kangaroo is quite fascinating. They have very strong legs that operate like springs. That is what allows them to be able to leap more than 15 feet at a time and to be as much as 5 feet off the air when they do. Their bodies use less energy when they hop which is why they do so. The tail is a vital part for them to be able to balance themselves both while moving and when standing still. While moving it works to help them land and keep their weight evenly distributed. When they are standing still the tail serves as a third leg. This allows them to be standing like a tripod would be. The short arms of these animals allow them to grasp things. They have very sharp claws on the ends of them. The females have the trademark pouch where they will carry around their young joeys. 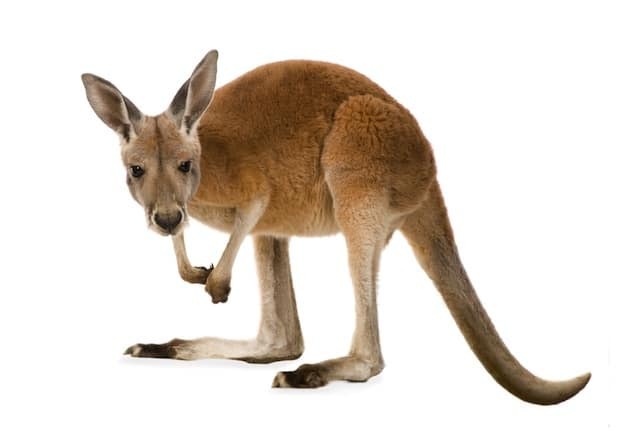 When it comes to the evolution process for the Red Kangaroo there isn’t very much that has been proven. There are many theories that they did evolve from the possum families millions of years ago. Yet there are plenty of experts out there that don’t believe in that at all. What is well know is that they are highly adaptable animals and that is what has allowed them to survive. Hopefully we will one day find more fossils that link back to the earlier days of the Red Kangaroo. Until then, it is fun to explore the many different possibilities out there. They are mainly nocturnal animals, coming out after the sun goes down and then resting during the day. The reason for this is that it can become very hot where they live. They need to keep their body temperatures regulated. The easiest way to do that is to rest during the day time and to find shady areas where they can relax. Once the sun is gone from the sky though they will become very active. Like all Kangaroos they live in groups that are called mobs. The size of them can range from just a few to more than 100. In each mob there is a dominate male and he is the one they all take their orders from. However, there are always more males in the mob trying to take over his position. That is why the leadership can change many times in a short period of time. Only the dominate male gets to mate with the females in the group and that is what they are really fighting for. It can be fascinating to watch the males take part in boxing matches to prove their strength. This isn’t an activity that the females will be seen being involved with. There are quite a few areas out there in Australia where you will find these Kangaroos living. They live the dry regions so they tend to stay around the mainland areas. They are often out in the open for people to easily view them. They are curious animals and they will explore the environment around them. That can lead to troubles though as humans continue to move in on their territory. Then they have conflicts and view the Kangaroos as pests. The destruction of their habitat only further fuels the fire between them and humans that want to use that same land for their own needs. They eat lots of plants and grass out there. They have teeth that are specially designed to allow them to cut the food supplies very close to the roots. Their molars grind the food but then they swallow it. Their body is designed for them to regurgitate it and to make a cud. Then they chew it again before they swallow and the body actually digests it. They do tend to wear down their teeth due to this process. However, they grow more in the back of their mouth. Then they are able to move forward and fill in those missing ones. This process continues for their entire lives. They don’t need to consume very much water at all. Yet the fact that they do live in the dryer regions means that they need more of it than other species of Kangaroos. They aren’t able to get as much from their food sources as those living in moist conditions. The Red Kangaroo is ready to mate around four years of age. They can do so any time of the year. They won’t mate though if there is a drought or food sources are very difficult to find. This is a natural method for them to be able to control population when they need to. The dominant male in the mob will mate with as many females as he is able to. The process from conception to birth is only about 30 days. The amazingly small joey will travel to the pouch where it will be well protected. It isn’t uncommon for the females to have a young joey that is several months old and then to have a brand new one. In fact, they can even produce different types of milk for them each to get the right nutrients that they need. Dingos which are very large dogs are common predators of the Red Kangaroo. They run wild through the regions where these Kangaroos live. These animals are very aggressive and you will find that even the adults are very afraid of them. When possible the Kangaroos will run from them. Females are more likely to stand and fight to protect their young. They have extremely sharp toenails which can even disembowel such a predator due to the force of the kick from them. The Tasmania Devil has been known to create problems for them too. However, this isn’t a huge of a problem as it once was. You see, the number of these animals remaining in the wild is drastically low and they are well on their way to extinction. Very few deaths of Kangaroos these days are the result of that particular predator. Humans are the other big predator of the Red Kangaroo. In many regions they are seen as predators. Many people are trying to use the land to raise cattle and sheep. Therefore they don’t want the food sources out there to have to be shared by the Kangroos. Plus, these animals eat very close to the roots so it is harder for it to grow back quickly.